A bland wine may be lacking in tannins or acid. A teaspoon of lemon juice or strong black tea may improve the wine. Hazes can be due to protein matter, pectin, starch or metallic contamination. Yeasts can absorb these proteins during fermentation and after racking, but not all wines can be cleared by repeated racking. If the wine is slow to clear and has finished fermenting, bake a few eggshells until dry and crush them and add a teaspoonful into a gallon jar. Leave the wine for a few weeks and it should be clearer. Crushed eggshells can also be added to bottled wine. There are several clearing agents available but their effects will be the same as this natural solution. Other agents include clay, gelatin and isinglass. One of the most common causes of haziness is pectin. If fruits are used which are rich in pectin, as are all stone fruits, then it must be removed. If a finished wine shows a pectin haze then one tablespoonful of Pectolase should be added and the wine left in a warm place for four days. This treatment is readily available from home brew shops. If the wine has completed fermentation and is still too sweet, this is called a stuck fermentation, which means that the wine has ceased fermenting before all the sugar has been converted into alcohol. The reasons for this can be too much sugar in the original recipe, or it can be brought about by premature racking, which means the wine was racked before fermentation had stopped. One solution is to put the wine back into a bucket and stir vigorously to allow the air into the wine. Hopefully, after a day or two, the wine will start working again. 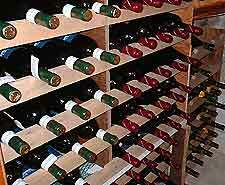 Another way to solve the problem is by racking the wine and adding a teaspoonful of lemon juice or yeast nutrient. Also by moving the demijohn from a warm temperature to a cooler one or vice versa may start fermentation again. Wine yeasts require a certain amount of vitamins for their growth and for a good fermentation. Where vitamins are lacking, such as in canned and dried fruits, a yeast energizer is called for. This is also very useful where wines have ceased fermentation prematurely.